It wasn't a very good weekend for me. Friday night was quiet. Varen worked a little late again. Seriously, am so over this and can not wait for him to start his new job on the 6th April ... and all those April long weekends :) Which reminds me that this time last year was Easter weekend ... the weekend we got our first baby bunny, Bell. I still think of you sweetie. 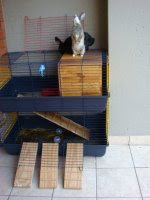 Which also reminds me that I took some photos of the latest crazy antics of Coal and Lily :) They're nuts I tell you! So as I mentioned before, their new favourite thing is to leap out and sit on top of the double-storey hutch when the top lid is open. I hope you can tell from the pic on the left just how high that actually is for a leetle boon. So far they've been very good to not try jumping off the sides! And Cola (no, not a typo, a nickname :) ) is very good about jumping back inside the hutch too. Lily not so much yet. As much as I wonder if Lil is a dwarf (I still am on the fence about this! ), I also wonder that if she is, she might just be able to do these things because she sees her big sis doing them. Bell & Henna never did these sorts of things! Saturday was quite a busy day. Varen and I started off at Doppio in Rosebank for breakfast (their Homemade Lemonade was delish!) and then we swung past Plaisir du Jardin to see if they had any of the bunny statues I wanted. Well they did, they had them is spades. Sadly they've all been left outside in the rain and even tho they're supposed to be rusty, they weren't in very good condition at all. I couldn't find a single one that was all rust - they mostly had these odd grey patches where the rust has come off or something. It was hugely disappointing. A little later (after Varen had gone home to work :P) I went to their William Nichol store and they didn't have any stock at all. Apparently they should be getting more stock for Easter, but we'll see. If I can't get one in good condition, it's not worth bothering me thinks. And then I hit Cresta for all the admin stuff I had to do. Was in urgent need of a new keyboard for work. Had a bit of an incident involving 2 glasses of spilled water in one week that left my keyboard typing insanely - when I pressed the 'n' or the 'h' key it'd type 'hn', and it did variations of that for about 10 different keys ... obviously something got fused :P So had been using a spare one for the last week but was in dire need of a replacement. I also came across a special for blinds, so our spare room will finally have blinds and we can take down the awful newspaper that has been up since we moved in (yes, over a year now, but only my folks have ever really stayed in that room when they've come to visit ... so it's not been much of a priority). And there was a bunch of other stuff, I'm sure but I forget ... And then Varen came to meet me for lunch. We decided to try out Plaka. I've only ever eaten at their Illovo branch before and Varen is not a fan of "communal food" so I was surprised when he suggested it. It was a lovely lunch tho :) I had a cocktail and we shared a dip selection (the Tirosalata is spicier than you expect! ), haloumi and a salad (they have that yummy melt in your mouth feta) while I had the prawns (yum!) and Varen had chicken livers (yuck!). I dunno why, but it was such a lovely lunch :) After that we finished up the shopping (I found some new jeans, yippee!) and went home. Later we went to Loulou's birthday party. And we had a lovely evening with plenty of laughs :) On Sunday we were supposed to go to gym (I skipped on Friday) ... but we didn't. 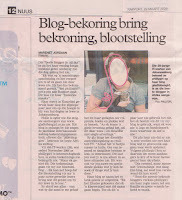 The SA Blog Award finalists were also announced yesterday and I am sadly not a finalist this year. It was quite upsetting initially, I think because I've been a finalist for the last 2 years and after last week's high of actually winning an award. And although I certainly didn't ever expect to win, I did sorta expect to be a finalist again ... But I'm gonna be doing a whole SA Blog Awards post shortly (wanna investigate the blogs and give you my recommendations on who to vote for etc. The really nice part of the awards each year is discovering new reads and I haven't had a chance to do that yet ... so till then!). Being in a marvelous mood, I acquiesced to Varen's request to see Watchmen ... in my defense it does star Robert Downey Jnr. A complex, multi-layered mystery adventure, the film is set in an alternate 1985 America in which costumed superheroes are part of the fabric of everyday society, and the “Doomsday Clock” – which charts the USA’s tension with the Soviet Union – is permanently set at 5 minutes to midnight. When one of his former colleagues is murdered, washed-up but no less determined masked vigilante Rorschach sets out to uncover a plot to kill and discredit all past and present superheroes. As he reconnects with his former crime-fighting legion – a ragtag group of retired superheroes, only one of whom has true powers – Rorschach glimpses a wide-ranging and disturbing conspiracy with links to their shared past and catastrophic consequences for the future. Their mission is to watch over humanity. Boooring. I had very low expectations. And they were well met :P This has got to be the most boring and tedious "super hero" movie ever. And I use the term super hero very loosely. That's the thing I totally did not get. They're not super hero's (other than the naked blue guy), they're "masked" people. In fact, it's even more boring than that, they're the second generation of masked people. Sigh. There were so many things that made no sense. Which is fine ... mostly. You can get away with a little of that if you want to. But seriously, colour changing material. WTF is up with that? And I didn't even come out of there knowing their "super hero" names ... they were all like "John" and "Laurie". The best part of this entire 3 hour marathon movie is the intro. That's it, walk out after that. And I also heard Watchmen sucked. I guess you have to read the book (or is it a comic?) to appreciate it. I don't think you should let the blog awards get to you, because surely it depends a lot on how many people other people could persuade to vote for them (ie friends and family)? I guess these things are never 100% objective. But that is the way blogging works I spose. There were a few blogs that I thought deserved to be in that were not. I can so relate - isn't it so funny that people can shower you with compliments but ONE person makes a negative comment and it's tough to let it go. Bottom line is that you were voted in for many reasons - one being that your blog is great to read so ignore the negative. No doubt that person was jealous of all the great (and deserved) exposure you are receiving. Want me to kill whoever made that nasty remark? Whoever it was, he or she is probably just jealous. 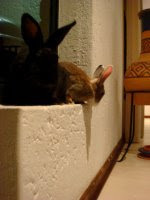 I love the fact that you got your bunnies into the newspaper pic. That is awesome! I also REALLY don't think that you should worry about the neg comment. It was bound to happen - unfortunately it's just the way people are. Love the newspaper article, and LOL that you blanked your face out. It was in the newspaper, people can find that. @po - it doesn't really get to me, it was just a fleeting disappointment. And I definitely agree that I'm not 100% in favour of all the finalists or even sure why they're there either. @tamara - sure thing! hee hee.